One of the reasons I love receiving coverage requests by exciting news bands and artists is that occasionally I come across a musician like Nicholas Burke. With your approval, I would like to shed my composed journalistic integrity for just one moment and resort to a brief outburst of inappropriate slang. Holy Sh*t, this man can sing. Well, now I have to back that up, right? 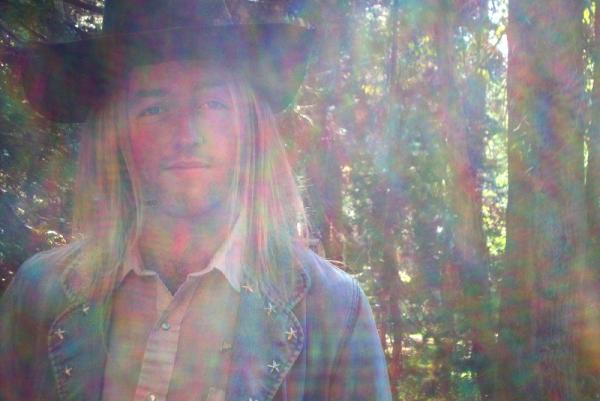 Nick Burke is a California-born psychedelic/country musician. His music combines a sun-drenched acoustic guitar with an effortless baritone that emerges from the arid desert like a permanent mirage. Burke’s granular tone is oddly smooth (ignore the contradiction) and his voice features a subtle old-fashioned quiver much like one musician whom I will boldly compare Burke with in a few lines. cautionary tale of man living life after love.” On completion of the album, it is tempting to pick up the needle and delicately place it back on the initial groove, only to realize that the tracks are on the computer and to repeat the album double clicking the first song is all that is necessary. The temptation is there because the album itself sounds older than it actually is. Burke is able to capture the warm atmosphere of past country troubadours – most prominently Johnny Cash. “The Man With No Destination,” the title track from the album, moves with the folksy, upbeat rhythm of acoustic guitars and chugging percussion. Burke comes in – his first line a restating of the song’s title – and instantaneously gathers the full attention of the listener. Johnny Cash was able to manipulate his croon and connect with listeners. Burke shares a similar quality. “Adios, Goodbye” follows “The Man with No Destination.” It’s a short ditty, fit with a proficient whistle, that also features a neat echo drop and toe-tapping guitar strumming. “It Ain’t Right” is a traditional country tune – with the twang and everything! But what remains most impressive, and I do not mean to belabor the point, is Burke’s rich, talented voice. It is just perfect for the type of music he is creating. While Burke may be The Man with No Destination, I know one place he should be – in your music library. You can purchase his new album here. Is it just me or is this guy very johnny cash-like? Also Matt, just out Karima Francis when you get a chance. New singer/songwriter/acoustic guitarist from the north of England. Great vibe and voice, and she’s rapidly gaining popularity (I have no personal interest other than being a fan). Thanks for the share. I will check it out when I get home. Great sound. Heck of a voice. Really enjoying it. Thanks!